A stethoscope is used for locating noises within machines and installations, such as those made by ventilators, pistons or pumas. This stethoscopeis ideal in preventative maintenance to check noises, control of vibrations, or the oscillation of pieces within the research and development sectors or for continuous inspection. Noises made by moving components are significantly amplified with the help of a stethoscope and environmental noise is reduced by way of the well insulated headset. The electronic stethoscope is delivered with two different measurement points, which allows for measurements in places that are difficult to access. A few stethoscope models offer additional functions, such as the Fourier analysis (FFT) for the accurate diagnosis of oscillations in the industrial sector; another additional function is the simultaneous detection of revolutions, or the optical inspection of the equilibrium mismatch. Basically, as a customer, you can always call the technical consulting hotline of PCE Instruments: 02903 - 976 99 - 50. The colleagues will ask you specific questions about your application and suggest the most suitable products to solve your measuring task. Below you may also find a few notes that you should consider when selecting or purchasing am industrial stethoscope. The main criteria by which an industrial stethoscope should be selected are the length of the rod probe and the frequency range. At PCE Instruments, you may find industrial stethoscopes with rod probes in various sizes. The supplied measuring tips are available in the versions: 70 mm, 165 mm, 280 mm and 290 mm. Some of our industrial stethoscopes include rod probes of two different sizes. In addition, some of our industrial stethoscopes, depending on the model, are equipped with one or more clamps, which allows some specific components to be examined more accurately. The clamps can be mounted in many places of a vehicle. As an example, axle bearings, brake forks, cardan joints, damper springs, injectors and many other parts can be mentioned. To carry out an accurate diagnosis, you must check all the parts during a test drive with the help of an industrial stethoscope, as there are other sounds heard when used on a hydraulic ramp. In our online shop, you may find industrial stethoscopes with different frequency ranges. Depending on your needs, you can opt for industrial stethoscopes with measuring ranges between 100 Hz ... 10 kHz, 30 Hz ... 15 kHz and 30 Hz ... 150 kHz. In our digital industrial stethoscopes, the measurements are also visually displayed on an LED display. The output volume in the electric stethoscopes can be set in 32 or 80 levels, so you can adjust the volume of the environment. Electronic stethoscopes can reduce or eliminate noise and interfering background noise and amplify the sound purely electronically. Note that our stethoscopes cannot be used for medical purposes! Our industrial stethoscopes are exclusively industrial products intended for machine diagnostics. Do not expose the measuring tip of the industrial stethoscope to extreme shocks, otherwise the device may be damaged. Note that manual acoustic listening with the industrial stethoscope is a purely subjective sensation, and thus different people experience different sounds when using it. In addition, the operating state of the machine or motor should be taken into account in order to carry out a correct analysis by means of an industrial stethoscope. Our digital industrial stethoscopes, the signal processing of which works based on the piezoelectric effect, provide for accurate measurement results. By that, in addition to the acoustic signal output, our electrical stethoscopes allow the optical representation of the measurements on an LED display, depending on the model. In order to obtain permanently accurate measurement results, our industrial stethoscopes are calibrated compliant to ISO and are recalibratable. Your in-house ISO specifications can be met, and industrial stethoscopes can also be included in the internal ISO test pool. The ISO calibration of the industrial stethoscopes consists of a laboratory calibration and certification. The name of your company or the data of the client are recorded in the calibration certificate. You can apply for an ISO calibration directly with the initial order of an industrial stethoscope or you can send us the device – e.g. annually – for recalibration. By default, industrial stethoscopes are used in the field of maintenance and servicing in the industrial sector, but also in crafts or in production and development. Should not a purely acoustic analysis with an industrial stethoscope be sufficient, we also offer test equipment for the metrological detection of vibrations. 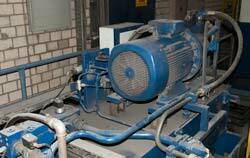 Please visit also our Schwingungsmessgeräte /vibration meters/page.